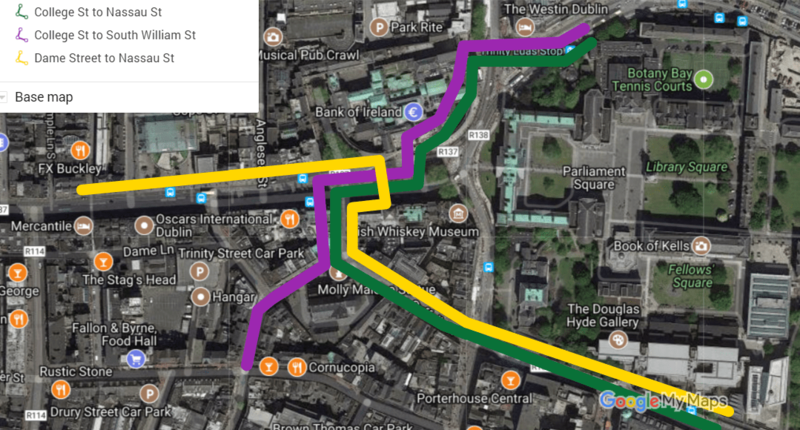 COMMENT & ANALYSIS: This website reported on Tuesday how a southbound bypass of Luas tram tracks at College Green is now open for use — it would take take little extra to extend the route to Nassau Street. A new contra-flow cycle lane on Church Lane and a crossing point of the tram tracks at Grafton Street would allow Dublin City Council to provide cycling access to Suffolk St and on to Nassau Street and beyond with reduced need for cycling along tram tracks with buses and trams. Because buses are no longer using Suffolk St, there is now scope on Church Lane (main image and red line in the map above) for a segregated contra-flow cycle path. IMAGE: A crossing would be needed where Suffolk St (left) meets Grafton Street (centre of photo) and Nassau Street (behind the camera). It would not be an ideal routing if it was an ideal world, but — much like the southbound bypass of Luas at College Green — this should be attractive to people on bicycles who want to avoid the tram tracks as much as possable. Cian, good idea. Note: In the explaining text below the street image you have switched Suffolk Str and Grafton Street. Looks good Cian. Not much of a detour when you see the map from above. It would be a great option for cyclists who want to avoid the tricky curve in the road in from of Trinity. This would also establish a cycle route to compliment the College Green Plaza. Clear street signage and images/maps is a must to clearly explain what the options are. At the moment it’s all very daunting for people on bikes, especially for people who aren’t familiar with the area. Btw, my comment above is directed at DCC. Ciaran good work a reference the original design would not hurt!